Kansas City: Andrews and McMeel, 1996. Fine. First edition. 241pp. Fine in pictorial wrappers. Kansas City: Andrews McMeel, 1992. Softcover. Fine. First edition. Fine in wrappers. Paper covers show light reader's crease and are lightly rubbed on edges, clean text, bottom text edges lightly soiled. Please Note: This book has been transferred to Between the Covers from another database and might not be described to our usual standards. Please inquire for more detailed condition information. MO: Andrews, 1992. Softcover. Very Good. First edition. Very good in wrappers, a paperback. Corners rubbed. Clean pages and cover. Please Note: This book has been transferred to Between the Covers from another database and might not be described to our usual standards. Please inquire for more detailed condition information. Kansas City, Missouri, U.S.A.: Andrews and McMeel, 1992. Soft cover. Very Good. From the book, ""America: What Went Wrong? is a solid indictment of how the rulemakers in Washington and the dealmakers on Wall Street have changed the rules of the game to favor the privileged, the powerful, and the influential--at the expense of everyone else. Barlett and Steele have managed to tell the story we all suspected in language so clear--and graphics so dramatic--that every reader will see how the lives of all of us have been touched by public acts and private greed. America: What Went Wrong? is a gripping portrayal of the painful dismantling of the American middle class."" Soft cover in like new condition. Text block clean and tight. No markings noted. Simon & Schuster, 1994. Trade paperback. New. Trade paperback (US). Glued binding. 376 p. Contains: Illustrations, black & white. Audience: General/trade. Andrews and McMeel, 1992. (Slightly edgeworn). 235 pages.. Probable 1st Printing. Soft Cover. Near Fine. 8vo - over 7¾" - 9¾" tall. Barlett, Donald L. And Steele, James B. New York, New York: Simon & Schuster, 1994 Book. As New. Trade Paperback. 1st Printing. As new trade paperback from an amazing book buy by a history collector. The condition of these books is amazing. Nice clean tight copy and in most cases appear unread..
Andrews McMeel Publishing, 1992. Paperback. Very Good. Very good paperback. Pages are clean and unmarked. Covers show very minor shelf wear. ; 100% Satisfaction Guaranteed! Ships same or next business day! Kansas City: Andrews and McMeel, 1992 Book. Very Good. Soft cover. Fourth Printing. Minor wear; a nice copy. A critical discussion on American politics and corporate power. 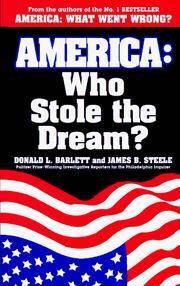 235 pages..
Barlett, Donald L. & Steele, James B.
Simon & Schuster, A Touchstone Book, 1994. 376 pages including index. Minimal display wear. By the authors of America: What Went Wrong. Media Mail, US Priority and some International shipping include free tracking information.. First Edition. Trade Paperback. New. 8vo - over 7¾" - 9¾" tall. Kansas City, MO: Andrews And McMeel. Good with no dust jacket. 1992. Trade PB. 0836270010 . Andrews Mcmeel. 1992. Later Printing. Softcover. 0836270010 . Fair, underlining and/or margin marking to about 50 pages or so, a corner crease. Sound binding. Trade size. Sold AS IS, do not purchase if condition is important to you. ; 235 pages . Andrews Mcmeel. 1992. Later Printing. Softcover. 0836270010 . Fair reading copy, neatly done highlighting to about half the pages, a little marginalia, title page name. Trade size. Sold AS IS, do not purchase if condition is important to you. ; 235 pages . Kansas City, MO: Andrews and McMeel, 1992. Reprint. Trade Paperback. Very Good/No Jacket. 8vo - over 7¾" - 9¾" tall. xvi, 235 pp. Third printing. The lightest of rubbing to the cover edges. The binding is tight and square, and the text is clean. Kansas City, MO: Andrews and McMeel, 1992. Reprint. Trade Paperback. Near Very Good/No Jacket. 8vo - over 7¾" - 9¾" tall. xvi, 235 pp. Fourth printing. The front cover is creased at the fore-corners. The binding is tight and square, and the text is clean. Andrews & McMeel, 1992 5th Printing. Trade Paperback. Very Good. BARLETT DONALD L. & STEELE JAMES B. New York, New York, U.S.A.: TOUCHSTONE BOOKS - SIMON & SCHUSTER, 1994. CURRENT AFFAIRS. IF YOU PAY TAXES, YOU NEED TO READ THIS BOOK. IT IS A DISTURBING, EYE-OPENING LOOK AT THE TAX SYSTEM GONE OUT OF CONTROL. ORIGINALLY DESIGNED TO SPREAD THE COST OF GOVERNMENT FAIRLY, OUR TAX CODE HAS TURNED INTO A GOLD MINE OF LOOPHOLES AND GIVEAWAYS MANIPULATED BU THE INFLUENTIAL AND WEALTHY FOR THEIR OWN BENEFIT. 376 PP.. First Edition. Soft Cover. Near Fine in Trade Paperback/No Jacket. Andrews & McMeel, 1992. Trade Paperback. Very Good. Kansas City: Andrews and McMeel, 1996. Trade Paperback. Good/Good.